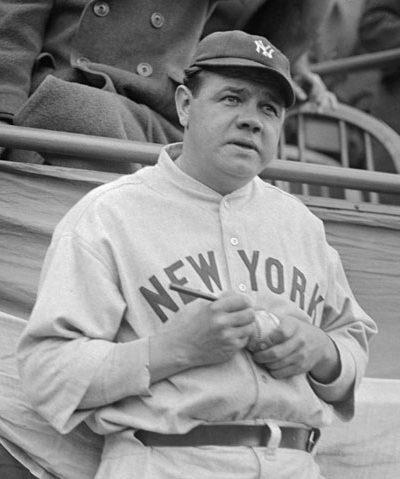 Waite Hoyt is the only member of the Baseball Hall of Fame to play in both the American and National Leagues before he was old enough to vote. 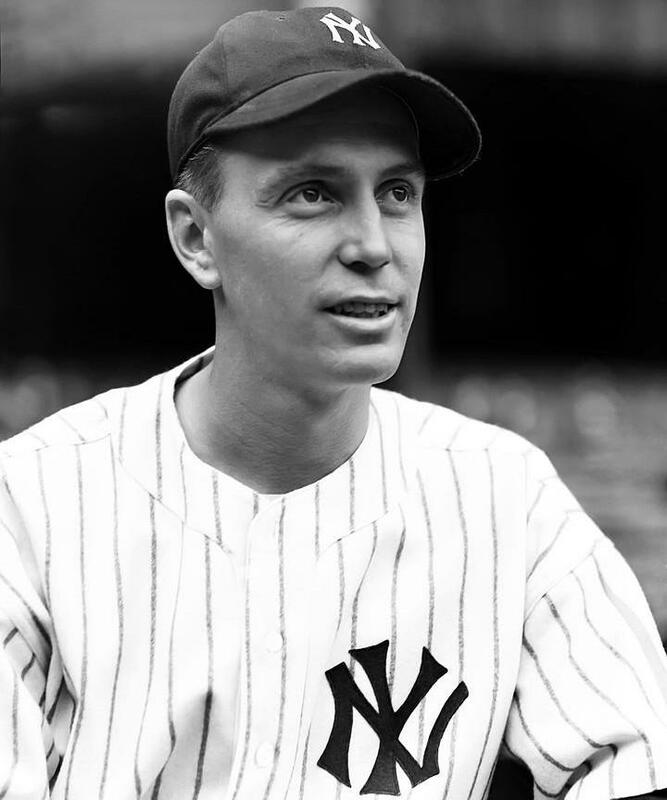 Best remembered for ten years, six AL pennants, and three World Series triumphs with the Yankees, Waite Hoyt suited up for six teams during his 21-year big league career. 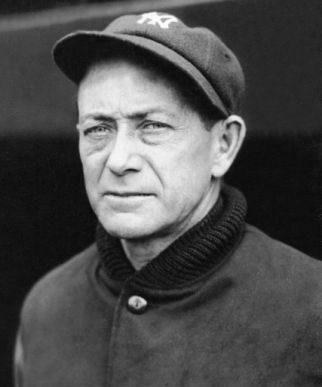 Shown here is a 1933 Goudey baseball card of Hoyt with the Pirates, a team for whom he won 35 games in five years. 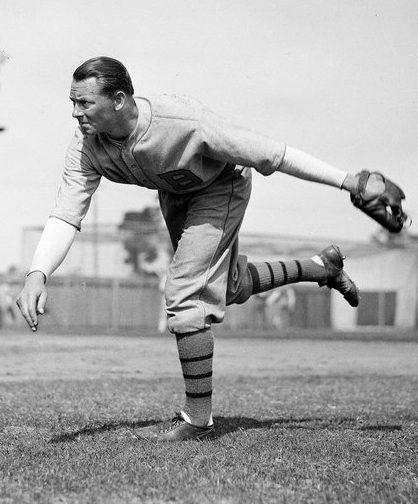 A two-time 20-game winner, Hoyt also won 19 games in two seasons and had one season each with winning totals of 18, 17, 16, 15. 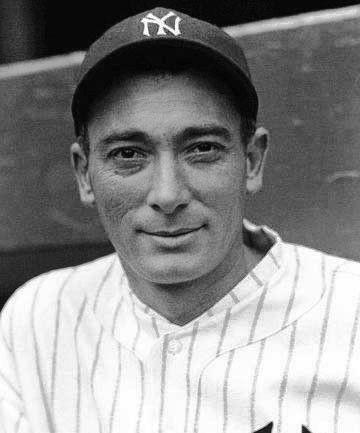 He was elected to the Hall of Fame in 1969. 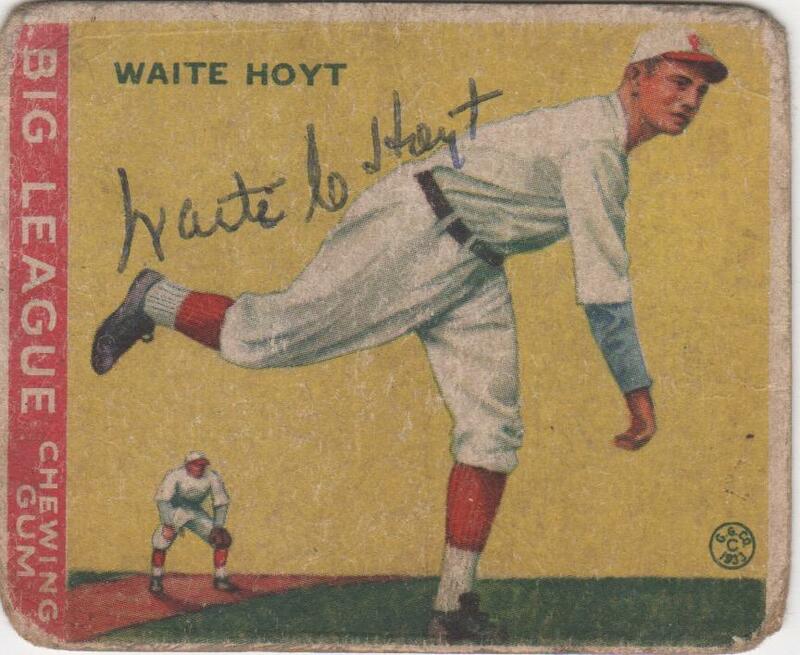 Hall of Fame pitcher Waite Hoyt ended his 21-year playing career pitching in Brooklyn in 1937 and 1938. 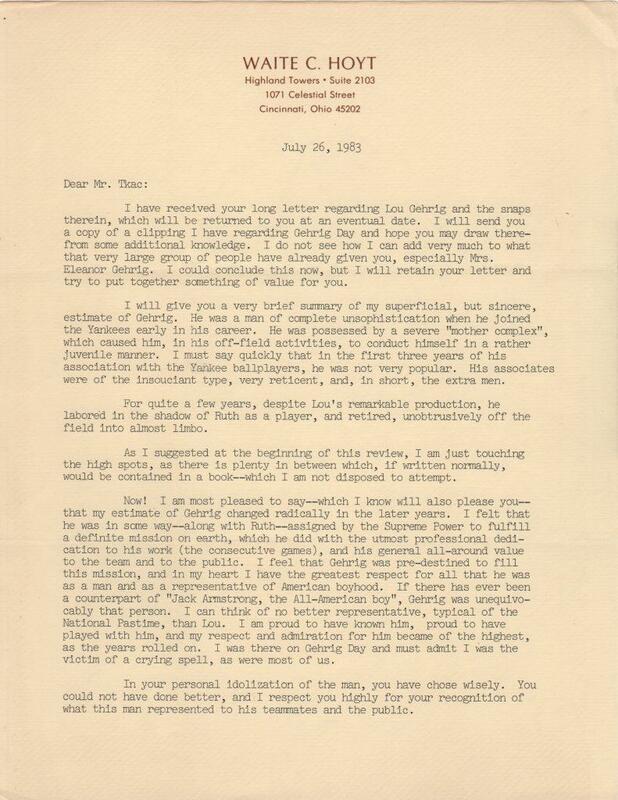 In this handwritten letter he answers a fan’s question about uniforms. “Yes! 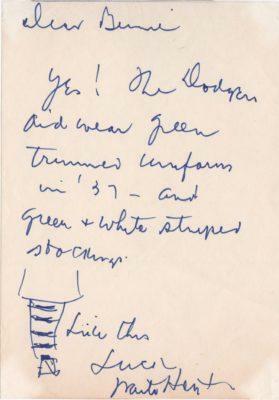 The Dodgers did wear green trimmed uniforms in 1937 and green and white striped stockings.” Hoyt then draws a picture of a striped stocked adding the words, “Like this”. 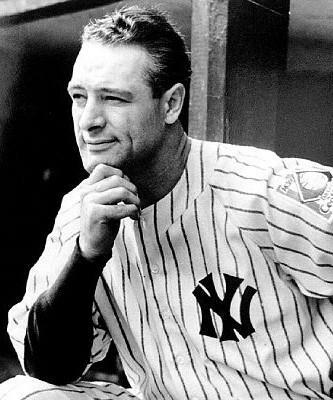 Lou Gehrig and Waite Hoyt were teammates from 1923-1930. Over those eight years Hoyt saw a terrific transformation of the Iron Horse from a man of “complete unsophistication” with a “mother complex” to a man “assigned by the Supreme Power to fulfill a definite mission on earth”. The entire content of the letter reveals Hoyt’s awe and admiration of Gehrig. 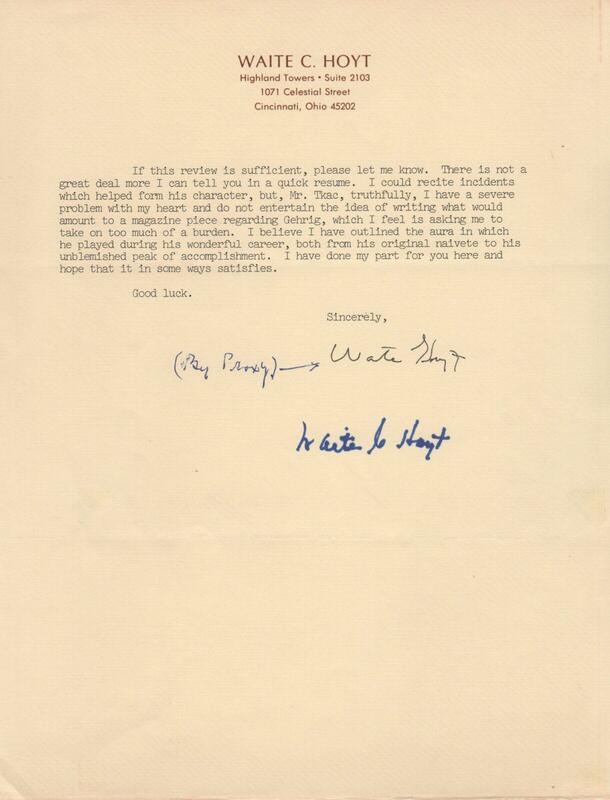 Truly incredible content worth reading is in this correspondence between two members of the Hall of Fame. 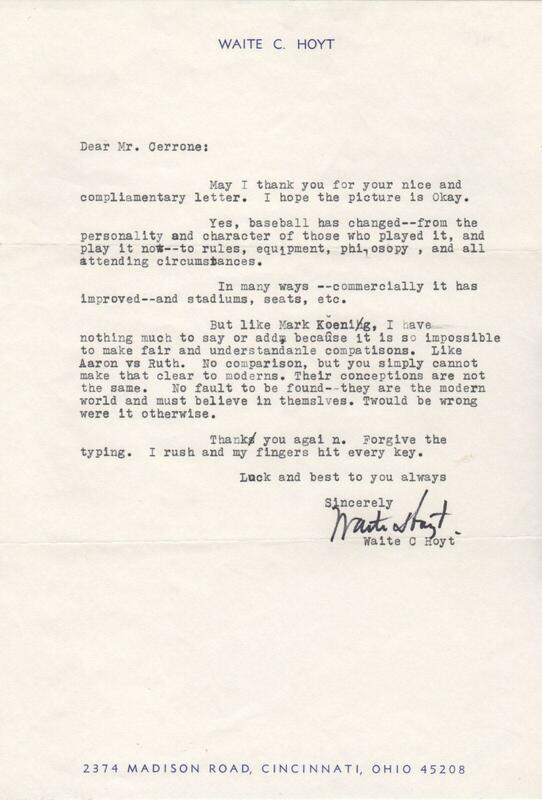 In the second page of this outstanding letter from Waite Hoyt about Lou Gehrig, Hoyt reaffirms his stance with a strong conclusion, “I believe I have outlined the aura in which he played during his wonderful career, both from his original naiveté, to his unblemished peak of accomplishment. I have done my part for you here and hope that it in some way satisfies.” Hoyt has signed in blue ink below at the bottom of the letter. 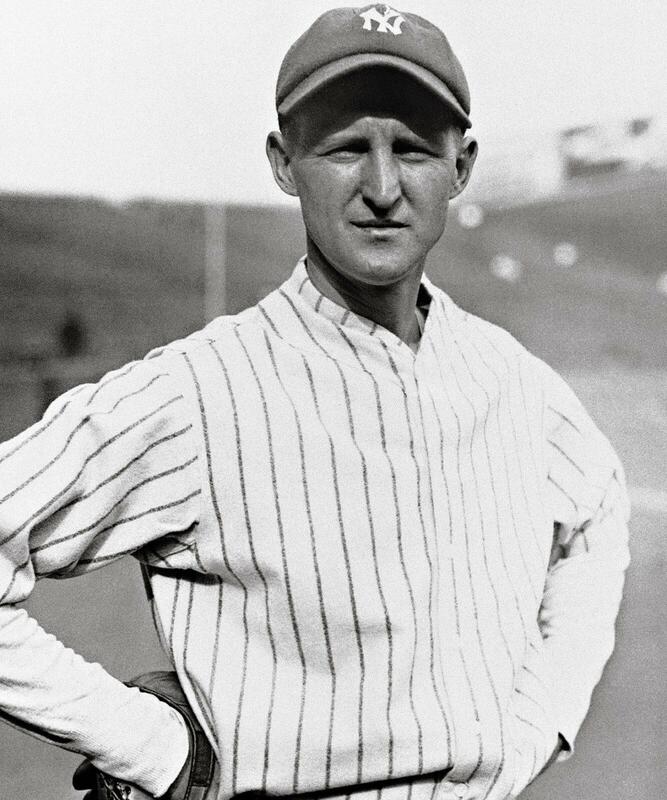 Love baseball & it’s history! Heck yes! Thank you for visiting our site, Frankie.